SAINT PETER, Minn. – The Gustavus men’s basketball team played host to the Central College Dutch on Saturday afternoon and took an 81-75 victory. With the win the Gusties improve to 2-2 on the season while the Dutch fall to 1-4. In a game that saw only three lead changes, Gustavus took its first lead of the contest with 7:06 remaining in the first half when Marten Morem (Fy., Caledonia, Minn.) hit a pull up jump shot to give the Gusties a 25-23 lead. They got their lead up to four points before the Dutch battled back and took the lead and went into the break on top by a margin of 40-35. The majority of the second half was controlled by the Gusties though as Peter Lundquist (So., Rochester, Minn.) scored two of his 13 points to tie the game at 50 before a Morem layup, two Lunquist free throws, and a three-pointer from Logan Rezac (So., Andover, Minn.) stretched the lead to 57-50. The Dutch got the game within two points two more times but the Gusties continually answered the call and scored to regain the lead, eventually putting the game away when Spencer Tollefson (Sr., New Richland, Minn.) hit two free to give the Gusties their 81-75 lead with 23 seconds left. Lundquist, Nolan Malo (Fy., Owatonna, Minn.), and Riley Sharbono (Sr., Marshall, Minn.) all pitched in 13 points for the Gusties, while Rezac notched 12. Malo and CJ Woda (So., Maple Grove, Minn.) each had seven rebounds to pace the Gusties and Woda also added seven points. 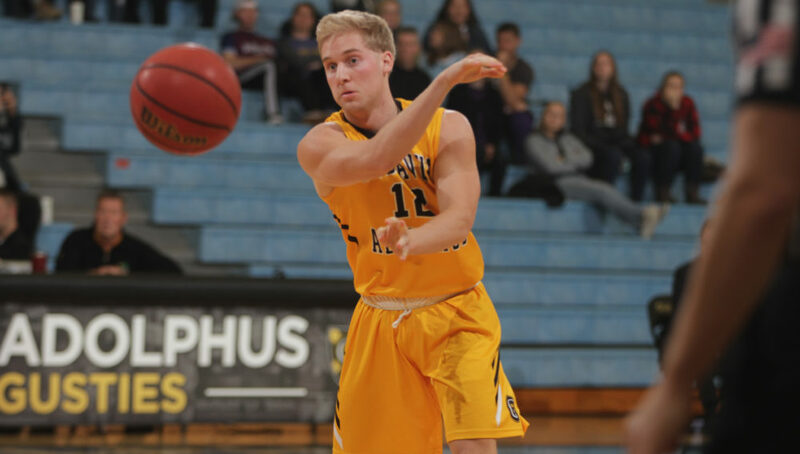 In the game, Gustavus out-rebounded Central 36-34 and had 15 assists to Central’s 12. In the decisive second half, the Gusties outshot the Dutch 57.1% to 43.3% and that proved to be the difference in the game. The Gusties will have a few days off before they head to Hamline on Wednesday night to begin MIAC play at 7 p.m. and Hanson believes the team is ready.